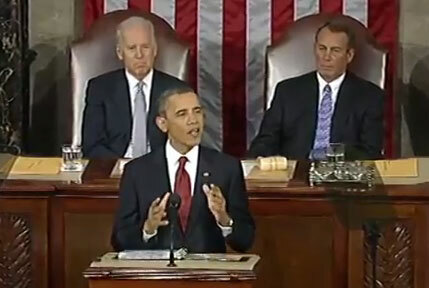 Barack Obama’s State of the Union Address – Should Steve Jobs Been a Talking Point? So I listened to the State of the Union address last night, which was pretty uneventful. There were many themes that were brought to issue. One of them is not losing jobs to overseas workers and not giving tax breaks to those who do. Yet, President Barack Obama singled out one entrepreneur for his integrity in Steve Jobs. While that was a “Feel good” moment, we have to reflect that your Apple product is not really made in the USA. Do we have a conundrum here? But wait a minute. Apple doesn’t make their products here. They have a plant in China that works people to the point where they continually have negative news coming back to the US. Most recently – a group of 300 announcing they would commit suicide over wages, and a chairman that calls their workers “Animals”. Steve Jobs said it himself to President Obama. He takes jobs overseas because there are no skilled workers. Further, in the Steve Jobs book, he tells Obama that he might be a one-term president if the business owners needs are not met and they continue to take jobs outside the US. Skilled Labor, or Slave Labor? I remember one Apple exec stating that China can get 3,000 workers overnight. They would stay in dorm rooms and work feverishly for the low-wage. In fact, is “Skilled labor” the real reason why jobs are ported overseas? It’s not the fact that you can get a worker for a fraction of the price overseas than in the US? Americans did live like that – back in the 1900’s. When Hoover Dam was constructed, people lived in communes. They had their own currency for rations, and they worked long hours for little pay. They had 112 fatalities, but more deaths to pneumonia which were unaccounted for due to the fact it wasn’t work related. What Should Have Obama Said About Jobs? I am not a politician, so I am not sure what would have been said better. Maybe something to effect of those aspiring to be Steve Jobs that are confident the US has the talent right now to do the job. Not that we are a bunch of un-educated misfits that need to stay in school. After all, Steve Jobs dropped out of school. Bill Gates did, too. How many different entrepreneurs dropped out, started a company and were successful? In the grand scheme of things, keeping jobs in the US is an important fact. However, to do it, will we have to accept 12 hour days at $17 an hour? Will we have to pay higher taxes to keep our jobs? All good questions that really didn’t get answers to. And while tens-of-thousands visit the Hoover Dam every year, do we want to live like those who built it?